Frontal headaches are located in your forehead and are often associated with tension headaches. Migraines in this area tend to be more one sided. Although headaches in this area can be caused by other problems, the most common, and fortunately most treatable reason, is trigger points in certain neck and upper back muscles. (Click here to learn more about trigger points.) A trigger point that causes a headache is also known as a headache pressure point. It is worth a shot to check these muscles and treat what you find to see if it will help you with your frontal headaches. Sternocleidomastoid (SCM) — This is a very interesting muscle that can create a whole spectrum of problems, from dizziness and nausea, to ear ringing and head pain. The muscle has two branches — the sternal branch that runs from the skull behind the ear to the breast bone, and the clavicular branch that runs from the same place behind the ear underneath the sternal division to the collar bone. Both parts can send pain to the forehead. The trigger points are located along the whole length of the muscle. For more complete info on this muscle, click here. Semispinalus capitus — This muscle connects the base of the skull with the lower neck and upper back. You will find the trigger points near the base of the skull. 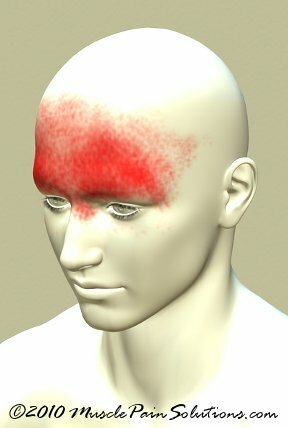 These trigger points tend to create a band of pain or pressure around the head. It is aggravated by bending your head forward for long periods of time (such as studying, reading, and writing). A tool like an Easy Reader that props your book up can reduce the strain on these muscles. It can trap the greater occipital nerve and create numbness, tingling, and burning pain on the back of the head and make it very painful to put your head on a pillow. Click here for a picture. Frontalis — This is a flat muscle that underlies the skin of the forehead. It is aggravated by stress, squinting, and prolonged facial expressions. Just press around in your forehead to see if there are any tender areas. Click here for a picture. Zygomaticus Major and Levator Labii — These muscles start at the cheek bone and lower rim of the eye socket and run to the upper lip. They create "sinus" pain, and pain up the nose into the forehead. They can even create allergy symptoms like a runny nose, sneezing, and itchy eyes. To massage them, just grab your cheek below your eye and kneed any painful spots. Click here for a picture. Check out the Headache page to find out more about what type of headache you have and get more tips on reducing or eliminating these frontal headaches. Return from Frontal Headaches to Home.